I am pleased to say that today I shipped another 600 books to schools in Jamaica. This shipment will be going to schools in rural St. Andrews. Last year when I was in Jamaica, I was visiting a Coffee farm in the Blue Mountains owned by Ivan Coore (who is the brother of Cat Coore, a member of the famous Third World Reggae Band) and Ivan introduced me to a lovely lady called Mrs. Violet Nelson in the Mount James District. She is the Chairperson of the local Basic School, the St James Day Care and Learning Centre. Miss Pansy (as she is known locally) showed me around her school and introduced me to the teacher (there is only one!) and children. The school is desperately in need of basic resources such as books, and she asked for my help. She also informed me of other local schools who would greatly appreciate the gift of a few books, and I promised Miss Pansy that I would do my best to help. I would like to say a big thank you to the following people who contributed so generously to this shipment: Mrs Dawn Powell, who came all the way from London bringing boxes of children’s books, some brand new, and delivered them to my door; Elenor Carrol from Birmingham Libraries who continues to support this project and whose help is so valuable; Coral Chapman, presenter at New Style Radio Birmingham, for the many bags of books she has collected from listeners; my long time friend Sheryl Thomas who also brought her books all the way from from Bath and delivered them to me; and to Beverley Johnson of JLB Shipping who once again kindly organised transport of the books to Jamaica. 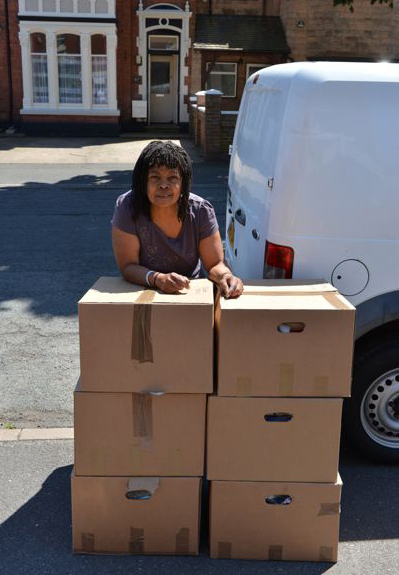 Here’s a picture of me with the boxes of books, in the driveway of my house, as they were about to be loaded on the van for shipping. I’ll be reporting from Jamaica later this summer when the books have arrived.